Packers defensive end Muhammad Wilkerson was forced from Sunday's game against the Redskins with a significant left ankle injury and did not return. It was recently reported that he will miss the rest of the season due to that injury. Ezekiel Ansah missed his second straight week as he continues to struggle through a shoulder injury. This has the looks of the type of injury that could plague him throughout the season. In typical Sean Lee fashion, he pulled a hamstring in last week's game (it was the opposite hamstring versus what he tweaked in Week 2). Given his storied injury history and the Cowboys sudden depth at linebacker, I expect Dallas to be extra cautious with Lee. It wouldn't be a surprise to me if he missed several games. Last week's waiver wire suggestion, Ricardo Allen, tore his Achilles' and will miss the remainder of the season. The Falcons could look to trade for Earl Thomas or sign Eric Reid as his replacement. Marcus Peters and Aqib Talib both left the Rams' game against the and did not return. Peters has been diagnosed with a strained calf and is expected to miss two to four weeks. Talib is undergoing surgery this week and is tentatively expected back in four weeks. Fantasy owners suffered a big blow when DB1 Reshad Jones was listed as inactive last week after being expected to play. Given he was so close to playing last week, he should be on track to start in Week 4. But it's the NFL, so you never know. 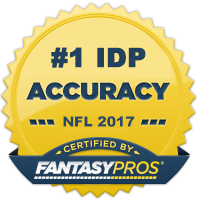 Safety Jaquiski Tartt was another key IDP inactive last week as he's still suffering from a shoulder injury he sustained in Week 2. Chris Conte played through a torn PCL on Monday night but was placed on injured reserve following the game and is expected to miss at least six games. Vikings defensive end Everson Griffen has reportedly been dealing with a serious, off-the field personal health issue and it looks likely he will miss significant playing time this year. If you have Griffen shares, you need to have a plan to attempt and replace his production. After going over two years without a sack, J.J. Watt finally broke out in a big way last week as he compiled three sacks (4 QB hits) against the Giants shoddy offensive line. Although he's not the all-world, consensus DL1 any more, he's still a top 5-7 fantasy lineman. One of the biggest IDP questions heading into Week 3 was if Fred Warner would retain a starting role, and if so, how much would he play? Well luckily for those of us invested in Warner, the 49ers were impressed enough with his play to keep him as the team's every-down MLB and he responded with an eleven tackle performance (9 solos). Looks like he's locked in as a strong LB1- play for the remainder of the season. DT Margus Hunt (IND) - Through the season's first three games, Hunt has emerged as a dominant force along the Indianapolis defensive line, registering 9 TFLs and 3 sacks. The scheme is somewhat limiting fantasy-wise, but Hunt's tenacity and high-volume of snap counts (averaging 84% of the snaps played so far this year) should allow him to remain a consistent producer throughout the season. Consider him a DL3+. DT Kenny Clark (GB) - Clark, Green Bay's 1st round draft selection in 2016, has shown steady improvement during his three-year career and is coming off his best game as a pro with 9 total tackles against the Redskins. He gets to face off against the Bills porous offensive line this week who have given up a league-leading 14 sacks. I like Clark's chances of getting to the quarterback this week and he should be able to contribute decent tackle numbers on top of that. DE Stephen Weatherly (MIN) - It sounds like Everson Griffen could miss a substantial amount of time as he works through some mental/personal issues. Although he's not the same caliber of talent as the rest of the Vikings' defensive line starters, Weatherly is going to see a lot of isolated one-on-one matchups and receive a fairly high workload. He played well last week putting up 7 total tackles and a sack is likely available in every league. I'm viewing him as a DL4-type add right now with a ceiling to grow into a low-end DL3. LB Vontaze Burfict - If Burfict is available in your league, this week is the time to scoop him up as it will be much more challenging next week as his four-game suspension will be completed. There's always a huge risk with Vontaze that he could miss more time due to injury or suspension, but for most people, the LB1 potential reward outweighs that risk. If playing every down he's a top 5-7 fantasy linebacker. LB Leighton Vander Esch (DAL) - Despite already having Sean Lee and Jaylon Smith at the linebacker positions, the Cowboys opted to select another linebacker with their first round pick this past draft. On the surface that may not have been seen as an immediate need but given both Lee and Smith's injury history, it was probably a prudent move by Dallas. In the limited snaps he's seen so far this year, Vander Esch has put up one of the best tackle rates in the NFL signaling to me that he has great fantasy potential in a full-time role. And with Sean Lee expected to potentially miss several weeks with a hamstring injury, LVE will get pushed into that every-down role. I'm expecting him to post big numbers while Lee is inactive. I would make Vander Esch one of your top waiver wire priorities this week as LB1- type production is definitely within the realm of possibility over the next few weeks. LB Josh Bynes (ARZ) - Despite a consistently solid start to his 2018 campaign, Bynes hasn't been getting much love in IDP circles. However, he should be. He's posted stat lines of 8-3, 4-3, and 7-3 and is the team's sole every-down inside linebacker with Deone Bucannon on the "outs." Additionally, he faces the Seahawks this week who are currently allowing the most points to linebackers. He's an above average rest of season pickup and a top 20 linebacker choice in Week 4. LB Anthony Walker (IND) - So far this season all the hype as been around the amazing start of Walker's rookie teammate Darius Leonard (deservedly so). However, don't sleep on Walker. There's room for another above average fantasy producer in that Indy linebacker group and Walker finally seems healthy enough for the team to leverage him in a near every-down capacity. To that point, he saw his snap percentage climb to a season high of 89% last week which translated into 9 total tackles, 1 PD, and 1 interception. Although he's not going to produce at the same level as Leonard, he's a nice LB3- consolation prize if you missed out on the potential DROY. S Antone Exum (SF) - Exum filled in for the oft-injured Jaquiski Tartt last week and had a huge performance racking up 9 solo tackles, forcing a fumble, and sacking the quarterback once. He's likely only a placeholder until Tartt comes back, but I think he can produce at a DB1/DB2 level for however long Tartt is out as his production is largely scheme-related. S Damontae Kazee (ATL) - The Falcons have lost both of their starting safeties to season-ending injuries, pushing Kazee into the starting limelight for the remainder of the year. He was impressive during the preseason and that strong play has carried over into regular season action. He racked up an impressive 10 tackles last week in the first game in which he saw full playing time (he was ejected early in Week 2's contest against the Panthers). Playing the Kam Chancellor role on a defense that is looking like it will see a lot of field time behind two relatively inexperienced linebackers puts Kazee in a prime position for top 15 DB fantasy production. CB Brian Poole (ATL) - Poole has been on fire to begin the season as he's generated 22 solo tackles, 2 sacks, and 2 pass deflections from his slot corner position over the first three games. Given the injuries to Keanu Neal and Ricardo Allen, there's a chance Atlanta could move Poole to safety. This would be a plus for owners in CB-required leagues as he would likely retain his CB eligibility but be providing you with safety-type production. He's currently in the CB1 conversation.